Plot: Superman Jr is a super screw-up, so Superman grounds him permanently by exposing him to Gold Kryptonite! Way to super over react, dad! 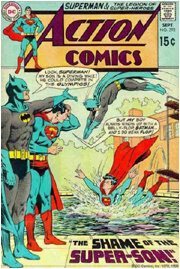 Review: A while back I did a “Hey Dork” column about the sons of Superman and Batman feature that ran in ‘Worlds Finest’ for several issues in the mid seventies. Astute Dorks were quick to inform me that the idea of Superman and Batman Jr. actually dated back to a 1970 imaginary tale in Action comics, which I was lucky enough to find in a dollar bin recently. It’s an odd little piece; mostly notable for having far less internal logic than even the series of later books I’ve already written about. The pencils look like Ross Andru to me, but there’s no writer or artists credit. It’s not really the sort of work anyone would want there name on, but it is a hilarious artifact of a time gone by, as proven by the customer survey I found in the back of the book. ANSWER ALL THE QUESTIONS SO WE KNOW WHO YOU ARE AND WHAT YOU THINK IS GROOVY. (Q) How interested are you in reading about: For each subject check 1.) I’m very interested, 2.) Fairly interested 3.) I am not interested. Okay, there was more, but you get the idea. Dollar bins are great. The only thing that’s clear is that Superman is a complete Superdick as a dad. Everything else is pretty muddy. We only see Superman and Batman’s wives from behind, like if we saw their faces it would give something away, which makes no sense. This is a self labeled ‘imaginary tale’ a staple of DC at the time. Supes could have been married to a toaster for all the difference it would have made to continuity, and in other ‘imaginary tales’ he’s married to Lois, so why the coy mystery? Superman jr. and Batman Jr. are next door neighbors and go to the same high school in costume, but also seem to have secret identities. There’s a great shot of Batman kicking back in his living room watching a western on TV IN COSTUME! When Superman locks himself in Jrs. Room and won’t come out, (which is creepy enough) his wife goes to their neighbor Batman who has a KEY TO SUPERMAN JR’S ROOM! No explanation given! (Extra creepy with a side of fries). The de-powered Superman Jr. is forced to borrow a bike from Batman Jr to gives his date a ride to the dance and is she pissed! Then there’s this weird catch the helium balloon game and she brags about how her ‘guy’ will win cause he can fly, completely forgetting that he had to pedal her to the dance and gets pissed all over again when Batman Jr. gets the balloon! I bet you think I’m making this up as I go along, and that’s exactly how I felt about the unnamed writer. There’s also a back up Legion Of Superheroes story featuring the first appearance of the ugly pink two piece bathing suit Saturn Girl would wear for the next decade. I’d always blamed that on Mike Grell, but apparently it was sent in by a reader. The story is all about the Legion pulling a bizarre prank on Projectra to see how she reacts because their computer said she was on the verge of a nervous breakdown. See, therapy in the future is different. My advice? Any comic you see for a dollar that is old enough to be cover priced 20 cents or less is well worth buying for the culture shock alone. You think there’s bad writing in comics today? You have no idea. I remember the Super Sons! Silver Age weirdness at it it's finest. I just found a super sons by Bob Harris that I'd never seen before in the dollar bin! I'll review it soon. YAY DOLLAR BIN! Keep those comics in plastic jackets, in pristine condition. They will be worth their weight in gold in 50-100 years. I have a Batman comic from, I think, the '70s that I bought at my local antique store. It was about the bad guy fake-killing Robin again and again to mess with Batman. It was very sick, and I'm glad I bought it, even if they did charge $5.00 for it.